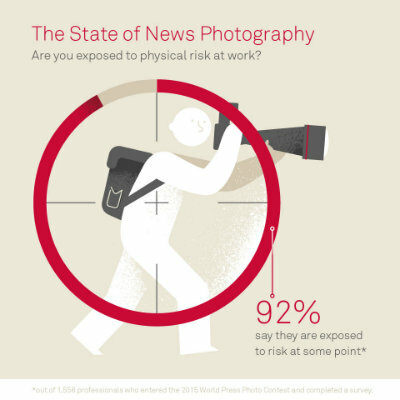 An extensive study of photojournalists has revealed the profession is dominated by men, with women more likely to be better educated and poorer paid. The World Press Photo Foundation report documents the experiences of more than 1550 photographers from 100 different countries. Researchers from the University of Stirling and the University of Oxford investigated the identities, working conditions, practices and ethics of current photojournalists. They found that just 15 percent of the photojournalists surveyed were women and 42 percent of those earned less than £6,600 per year compared with 34 percent of men, whilst many more men earned over £52,000 than their female counterparts. Eight-two percent of females surveyed were university educated, compared with 69 percent of males, yet one-quarter reported no specific photography training. "The anecdotal evidence suggested this imbalance existed, but we were very surprised to see how significant the differences really are," said Dr Adrian Hadland, Project leader and Senior Lecturer in Communications, Media and Culture at the University of Stirling. The report also highlights the dangerous nature of the role, with 90 percent of respondents indicating they felt vulnerable to the threat of physical risk or injury. South America, Central America and the Caribbean were recorded as the most dangerous regions in which to work, whilst Europe and North America were the safest. However, two-thirds of respondents said they were happy with their livelihoods and enjoyed a high degree of job satisfaction. Dr Hadland added: "As journalism scholars, we knew things were changing fast for photojournalists as a result of rapid developments in technology, the restructuring of the news sector and the emergence of citizen journalists armed with smartphones. "But until now, we had no way of knowing how all this was impacting on people who make their livelihood shooting pictures. Here, for the first time, is the story of how photojournalism is changing in the digital era based on data from photojournalists in more than 100 countries. "Our findings are surprising, even shocking in some respects, but they are also encouraging. This is a profession in flux and facing enormous challenges, but enjoying the freedom and creativity that is increasingly possible." Stirling’s renowned Communications, Media and Culture division deliver a wide range of Journalism, Communications and Public Relations degree courses, including a new undergraduate Digital Media degree in partnership with Forth Valley College. Dr Hadland and colleagues will continue to work closely with the World Press Photo Foundation to track developments over the next three years and track changes over time. World Press Photo Foundation managing director Lars Boering said: "The World Press Photo Foundation supports professional photographers and visual journalists in their work. Collaborating on research to inform the community is one of our important functions, and we are delighted to both share and learn from these important findings. This study gives us reliable data on many of the challenges the profession faces, and this will help all of us address those challenges." Read the full Photo Journalism Report.